Overweight, fatigued, lethargic, mood swings, depression, bed-wetting, underdeveloped bladder, anxiety, diarrhea, constipation, sharp stomach pains, gas, headaches, nausea, canker sores, delayed puberty, rashes, consistent tooth problems, heart arrhythmia, and consistent colds. I will never forget where I was when I realized my list of health concerns were anything but “normal”. I was in a porta-potty in the middle of Eastern Oregon, praying that I could actually go one day without having chronic diarrhea or constipation. I had taken a weeklong road trip with my friends, and although we were expecting to explore the beautiful sights of Oregon, we spent a majority of the time finding bathrooms and listening to my complaints about my horrible headaches and nasty stomach pains. After returning from the road, I made a trip into the doctor’s office and essentially demanded an explanation. I wanted to know why I was sick, and what the doctors were going to do to make it better. I was born a healthy baby with no apparent health issues. As an infant I had very few health problems aside from a heart arrhythmia, and an unexplained rash. The doctors informed my parents that the rash was no concern and I would grow out of the arrhythmia. Growing up I was a fairly normal kid. I grew up on a farm south of Corvallis, and was raised by my dad. I spent most of my childhood playing in the fields with my sister and cousin. However, my sister and I also spent a lot of time inside the house, sick with various flu’s and colds. I was sick throughout a large portion of elementary school. In the third grade I missed a month of school because I was sick with a cold that just wouldn’t go away. My weight was becoming a problem. I had previously been a fairly small child, but I started to gain weight that refused to come off. I also had horrible bladder problems, and was a constant bed wetter. My doctor didn’t think much of my weight or flu problems, and prescribed medication for my “underdeveloped” bladder. Another large portion of my childhood was spent in the dentist office. Genetically my whole family had bad teeth so it was only standard that I would make monthly visits to the dentist. I made it through my middle school years with very few problems, and it wasn’t until high school that my health issues became more prevalent. I started to have problems at home. I had become extremely moody, depressed, and irritable. My dad and stepmom had a hard time dealing with me, but just assumed that I was a difficult teenager. At this point I was obese, anxious, and had become extremely shy. I had also begun to realize how irregular my bowl movements were, and at the age of 14 I was still wetting the bed. Going into the doctor for my annual check up, I expressed all my health concerns and poured my heart out about my depression and anxiety. My doctor decided it would be best to put me on an antidepressant, and told me that otherwise he had no concerns. As I began to move my way through high school, I put my issues aside and focused on doing well in school. I continued to have the same health concerns, and developed a few more. I started to have stomach pains, I was fatigued, I had constant headaches, I had a mysterious itchy rash on my knee, and I had not started my cycle. My doctor decided that the majority of my problems were developing from being overweight and that my headaches were due to my need to wear eyeglasses. He referred me to optometrist and recommended I started watching my diet and working out. This would be the last time that I saw this doctor. While I was having my own health concerns, my sister was having severe health problems of her own. My sister Mary had also suffered from health issues her entire life. Unfortunately hers were much more severe and prevalent than mine. Mary was overweight, often presented flu symptoms, and had chronic back pains, stomach pains, chronic diarrhea and a long list of other problems. When our family practitioner dismissed her back and stomach pains, my parents decided to take Mary to the emergency room. Within hours of being in the ER, the cause of Mary’s chronic pain had been discovered. She had a 20 lb benign tumor in her stomach that had wrapped itself around one of her ovaries and was continuing to grow. After removing the tumor Mary made a slow recovery, but still continued to have persistent health problems. After seeing several different doctors and specialists, and developing several new health issues, Mary was finally diagnosed with Celiac Disease. Knowing that our previous family doctor had severely misdiagnosed Mary, our whole family began to see a new doctor. After returning from my weeklong excursion with my friends I marched into this doctor’s office and demanded answers. To my surprise he listened to me, took notes, asked questions and looked for answers. Although he had not been the doctor to diagnose my sister, this doctor knew celiac disease was a genetic disorder and decided to do a blood test. 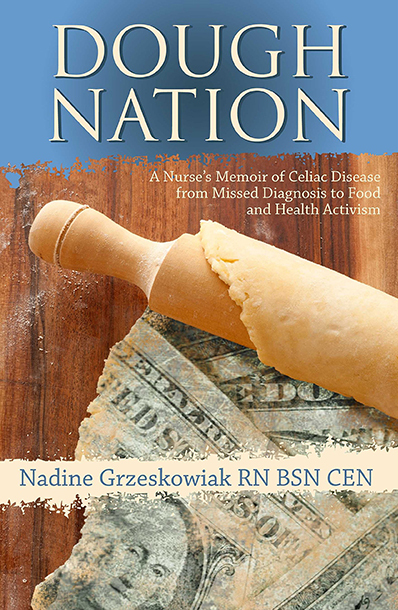 One week later, in September of 2004, I was diagnosed with Celiac Disease. In the following year I began to turn my life around. However, attempting to become 100% gluten free was anything but easy. When I was first diagnosed there were no gluten free bakeries, there was little to no selection of gluten free products in the store, and eating at restaurants was near impossible. I was overwhelmed with how to grocery shop, how to eat, and how to go on living a normal life. Unfortunately, my insurance would not cover a nutritionist or specialist and my family could not afford to send me to one; so I started research on my own. I went to the library and searched for hours on the web, and I started my journey to being gluten free. Within weeks of starting a gluten free diet I began to have normal bowl movements, my mood was improving, my headaches were disappearing, and I was finally beginning to lose weight. As far as I was concerned I was on a gluten free diet, little did I know that everyday I was continuing to harm my body. In January of 2005 I started my first job at a local pizza shop. I would continue to work at this pizza shop for the next 6 years of my life. My first year working was also my first year being gluten free. I remember feeling like I could do anything; most of my symptoms had gone away. I was finally healthy, I had friends, my energy was improving, and best of all I had lost almost 100 lbs. It wasn’t until 2007 that I realized my job could be causing me health issues. I was feeling sick quite often, I had horrible nausea, sharp pains in my chest, a rash on my hands, mood swings, canker sores, and continuing teeth complications. When I developed the rash on my hands I decided to go to the doctor. I told him about my nausea and sharp pains, and I showed him the rash on my hands. He ordered me a pregnancy test (for the nausea) and told me that the pizza shop could NOT be making me sick. He explained that gluten had to be ingested, and that while I was around gluten I wasn’t ingesting it so it couldn’t possibly be harming me. I was told that if I wanted proof then I could have the endoscopy test done. I agreed and we went ahead with the test. 500 dollars later I still had no results. My doctor informed me that the camera revealed I was fine. He told me to write down everything I ate and if I continued to feel sick to come back and see him in six months. After talking to my family I decided maybe I was being silly, and perhaps this is how I was supposed to feel. This is when I realized that maybe I was never going to feel 100%, and I might spend the rest of my life feeling less than average. Over the next three years, I continued to have persistent health problems. Although I knew my doctors and family thought I was a hypochondriac, I still continued to make various trips to the doctors for all different reasons. I was given all types of tests and blood work for all different diseases and ailments. I complained of constant nausea and sharp stomach pains. So I was given several different pregnancy tests, stool tests, and ultra sounds. Then when they couldn’t find a problem I was given prescribed medication to ease my pain. I felt fatigued and tired all the time, so they took my blood work for anemia and thyroid problems. When those came back negative I was told to exercise more and stress less. I had severe mood swings and irritability, so I was told that I was on the wrong type of birth control and was put on several different types. I had severe canker sores on every part of my body, so I was tested for herpes… 4 times. When they finally ruled out herpes I was given an ointment to put on the sores to ease the pain. I was also told that I had mono, heartburn, nerve damage, and stress headaches. It seemed that every doctor had a “treatment” for my problems. However I didn’t want a “treatment” I wanted a solution. I was tired of wasting my time and money on doctors who weren’t invested into truly making me feel better. It was 2010 when I finally realized that my doctors were not going to be my advocate and I had to take my health into my own hands if I wanted to get better. I decided to forget everything my doctors had said and I turned to forums and blogs on the Internet. This is where I discovered the overwhelming consensus that not only were my symptoms related to celiac disease; they were most likely a direct result of my daily exposure to gluten through work. Of course at this point I was outraged. I knew what was making me sick, and I realized I had no idea how much damage had been done to my body over the last six years. I decided the best thing I could do was move forward, and I took every precaution I could. While I was at work I wore masks, gloves, and I didn’t touch any loose flour, but my symptoms were still prevalent and only seeming to get worse. Unfortunately finding a new job was not an easy task. I had worked at the same place for the last six years. My job had become a part of who I was. I developed a strong relationship with my boss, and she had invested a lot into developing me as her manager. However I knew that my quality of life could be dramatically changed if I was able to find a new job. Shortly after I started my job search, I was lucky enough to find an opening working at the Gluten Free RN office. Luckily Nadine at the Gluten Free office rescued me from my gluten filled job and I have been “officially” gluten free for the last six weeks. Everyday I take note of what I eat and how I am feeling and honestly I did not know it was possible to feel this healthy. If I had known that it was possible to feel this alive, I would have quit my job at the pizza shop years ago. I haven’t had mood swings, I have no nausea, headaches or sharp pains and best of all I actually have energy. I know that my body has a long way to go before it is damage free and I still have an occasional day where I don’t feel 100%. However, I feel truly blessed to finally be on a path to having a truly gluten free lifestyle.